This charming 3BR/2BA home sits on a one-acre parcel with woods bordering the back of the property-- providing ultimate privacy. Outdoor enthusiasts can easily access nearby lakes, state parks, and a golf course. 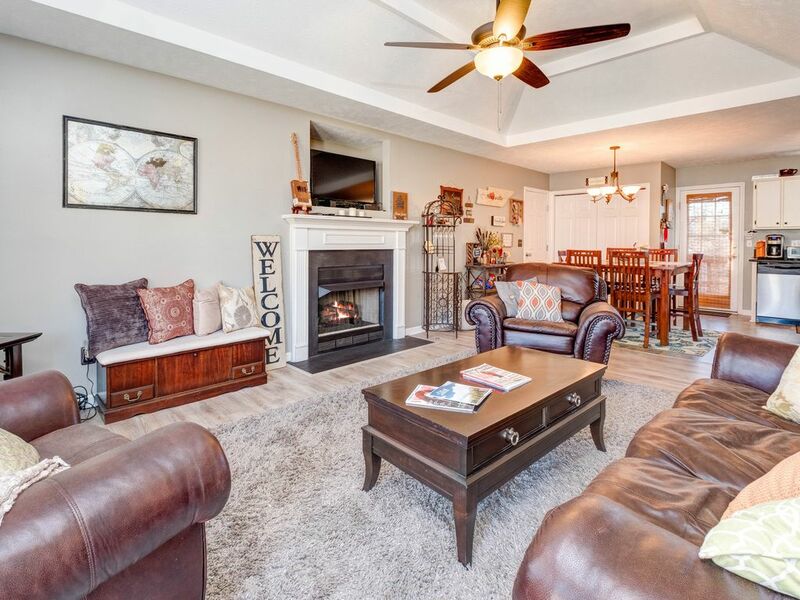 Located on a quiet cul-de-sac just 30 minutes from bustling downtown Nashville, this single-story home features vaulted ceilings, a cozy gas fireplace, and private outdoor living space. Sprawl out on the leather couch (that doubles as a queen-size sleeper) in the living room and enjoy a Blu-ray movie on the 40” TV with cable. Two additional armchairs offer a cozy seat for relaxing by the gas fireplace. Grab a puzzle and gather around the coffee table. The well-equipped kitchen features all-white cabinets and stainless steel appliances. Enjoy home-cooked meals together at the dining room table set for six. This home includes three bedrooms that sleep eight total. Two full bathrooms are each stocked with a complimentary starter supply of toiletries. The master bedroom is outfitted with a king-size bed, 30” TV with cable, and large closet. The en-suite bathroom features a double vanity and tub/shower combination. The second and third bedroom both offer a queen-size bed, ceiling fan, and a closet. A spacious outdoor deck is complete with a dining table and four chairs. Fire up the gas grill and relax while you watch the sunset. Bench seating for two is available on the front porch-- a bonus outdoor space. Outdoor enthusiasts can explore surrounding lakes and nearby parks including Charlie Daniels, Long Hunter State Park, and Robinson Park. Or check out Nashville’s Parthenon in Centennial Park-- the world’s only replica of the ancient Parthenon in Greece. 30 minutes from bustling downtown Nashville you’ll find live music, rooftop bars, and museums such as Country Music Hall of Fame, the historic RCA Studio B, and the Musician’s Hall of Fame and Museum. Don’t miss Honky Tonk highway for a dose of hot country music. Grab a coffee at Billy Goat Coffee Cafe and delectable cupcakes at Short Cakes Cakery-- both less than 10 minutes from home. Check out Courtney’s for down-home southern fare paired with live music, or try the fresh guacamole prepared tableside at lively Los Compadres cantina. The home was as listed. nice and clean, everything worked as it should. We mostly just used it for sleeping. there is great little bar not far away called "the Lucky Rooster". It is about a 38 minute drive to Broadway, and about a 20 minute drive to Opry. This is in a nice little neighborhood at the end of a dead end street, so it felt very safe. WOULD BE A NICE PLACE IF THEY WOULD GET EXTERMINATOR AND NEW TOILETS.WE SAW ONE DEAD ROACH AND TRIED TO KILL ANOTHER.ALSO HAD TO HOLD TOILET HANDLE UNTIL IT FLUSHED. We had a wonderful stay in Mt. Juliet in this very nice home. It was clean, very quiet neighborhood, and close to everything we needed. Our family came together to meet in Tennessee for Thanksgiving. The kitchen had all we needed to prepare the meal. Wonderful view out back door, very private. All in all, will try to stay here again if we get that way. House was lovely - clean - well decorated. The uber downtown was about 20-25 min. Further than I like to be but the house in general was very nice and comfy. The neighborhood is quiet. My wife and I stayed in this wondweful home for 4 nights along with our 2 children visiting Nashville from Portland Or along with a friend. The home is beautiful, well appointed with everything you needed to make your stay comfortable and enjoyable. It was very clean and furnished with sufficient accomodations for 6 people plus had nice homey touches to make you feel relaxed and welcome. My thanks to the owners for use of their beautiful home. My family had a wo0nderful stay in this beautiful home. Pre arrival info and access instructions were helpful, the home was located ona beautiful lot in a quiet cul de sac which was handy to grocery stores as well as quick access to Nashville. Home was clean, very comfortable and beautifully decorated with lots of homey touches.